BOSTON, MA (November 17, 2018) – The Armenian International Women’s Association announced Rachel Onanian Nadjarian has been named Executive Director of the non-profit organization, founded in 1991 and devoted to serving the needs of Armenian women throughout the world. Read more at Recent News. 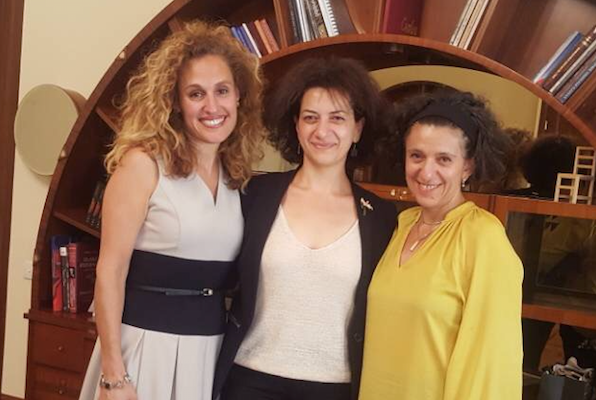 Visiting AIWA Board members Rachel Nadjarian and Anna Ohanyan were welcomed by invitation to meet with the Prime Minister’s wife, Mrs. Anna Hakobyan Pashinyan. Read more at Recent News. The AIWA 2018 UN NGO CSW62 panel "Amplifying Voices: Pathways to Ensuring Rural Gender Equality" featured a panel of esteem speakers including: Dr. Kim Hekimian from Columbia University Medical Center and American University of Armenia, Andrea Montalbano from GOALS Armenia and Marie Lou Papazian from TUMO Center for Creative Technologies. This panel was moderated by AIWA Board member Nicole Vartanian, Weatherhead East Asian Insitute at Columbia University. © 2018 Armenian International Women's Association, Inc. All Rights Reserved.